Pencil skirts are no longer reserved just for the office. Pencil skirts are indisputably a wardrobe staple, and one that every girl should have in her styling arsenal. the pencil skirt is a lot easier to wear and is perfectly stylish for day or night. Right now, the must-have hemline for this classic piece is a midi length that hits below the knee. They seem to work on every frame and every shape. Pencil skirt can be worn with a variety of blouses, blazers, and accessories, meaning you’ll get plenty of bang for your buck. I styled my skirt for an easy day time to evening transition look. Keeping the accessories minimal, I opted for super trendy white Tommy Hilfiger watch in rose gold. 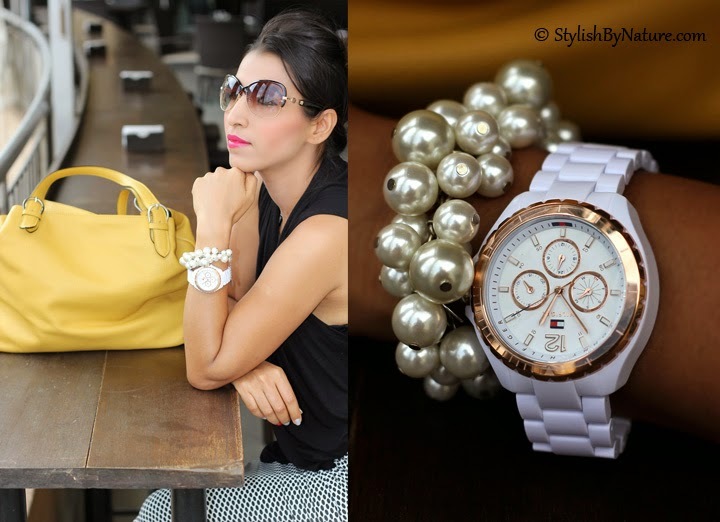 Dangling on my wrist amidst a bunch of pearls, this is my favorite watch from Summer Collection 2014 of Tommy Hilfiger. This premium lifestyle brand offers its collection to those who embrace classic lifestyle, confidence, elegance, luxury and a classy statement with sophistication. As one of the world’s leading premium lifestyle brands, Tommy Hilfiger delivers superior styling, quality and value to consumers worldwide. No wonder, its quite a popular one among SBN readers too !! For day time, I always prefer a big shopper to comfortably lunge around me ... holding all my essentials with elan. This JavaPlum yellow bag is not only apt because of its size, but also, for the color quotient it landed to my otherwise monochrome outfit. Don't forget to read the review here .... and I am sure you would be tempted to own one for yourself ! !